In general, two main methods are used to solve and alleviate congestion in WSNs and 6LoWPAN networks: rate adaptation (traffic control) and traffic engineering, i.e. selection of an alternate non-congested path (resource control) to forward packets to destination nodes [1, 2]. In traffic control, the sending rate of the source node is reduced to a specific value such that the number of injected packets into the network is reduced and therefore, congestion is alleviated. However, for time-critical and delay-constrained application (e.g. medical applications and fire detection applications), reducing the data rate is not desirable and impractical. In the resource control method, packets are forwarded to destination node through alternative non-congested paths without adjusting the sending rate. However, sometimes non-congested paths are not available and therefore, congestion cannot be avoided. Thus, it is very important to combine the above two strategies into a hybrid scheme and utilize the positive aspects of using both traffic control and resource control. In such case, the resource control strategy is firstly used for searching non-congested paths. If they are not available, then the sending rate is reduced by applying the traffic control strategy. 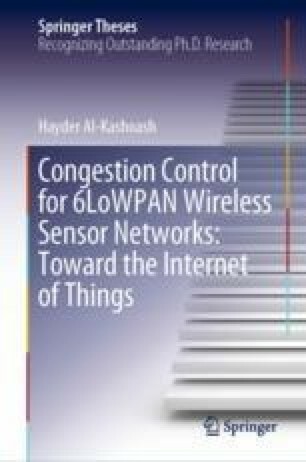 To the best of our knowledge, no existing congestion control mechanism in 6LoWPAN networks combines both strategies to solve the congestion problem.